Copying and pasting, however, from PDF to Microsoft Word creates an alignment problem which I have been patiently dealing with for weeks already. Realizing that I have barely achieved a significant percentage of repost–my Feedfabrik proof PDF file has more than 1200 articles–I finally turned to the internet for help. Someone out there must have had the same issue. I was right. Thanks to Superuser.com, I found the answer to my problem. And it’s a very simple one. 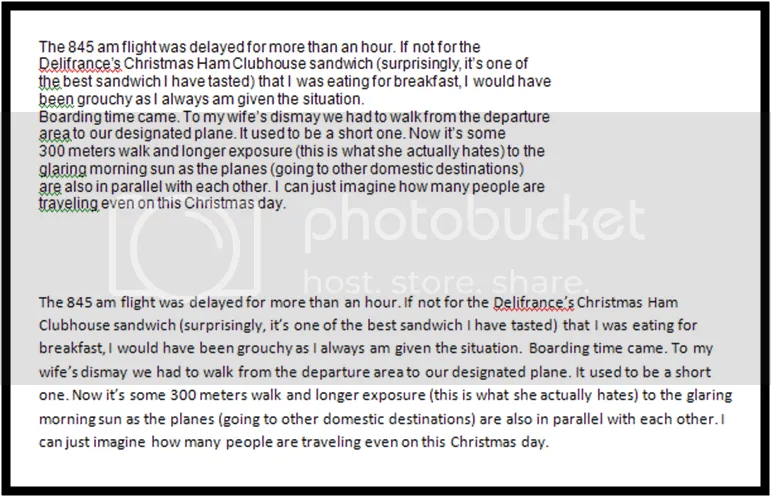 Shown below is a screenshot from my MS Word that shows the same set of text from my PDF file. Don’t mind the excerpts, I’m about to edit it. Upper half of the picture is how it appears when text is pasted directly from the Feedfabrik proof.pdf file. Looks easy to align, right? But if there’s a thousand pages to deal with, trust me, it will drain anyone out. The lower half of the picture is the way to go and it’s done using a neat trick from Superuser.com which I simplified below. 1) Copy text from PDF. 2) Paste text on Google search box (I assume this will work with any other internet browsers). Do not worry about the length of the text, it doesn’t matter as the next step will get everything back. 3) Use CTRL+A (or CTRL+X) to copy every text you pasted on the search box. 4) Paste text on MS Word. Take note though that if there are multiple paragraphs being copy and pasted, each paragraph has to be manually separated from the other. But this is something I can handle unless there is another trick to solve this. Now where was I? Ah, December 22, 2006. Hmmm, bad grammars.